Some topics are harder to teach than others. Spiritual concepts such as endurance, patience and faith can be difficult for children to grasp. Fortunately, there's an incredible resource available to help you create Sunday school activities about endurance. Children's Worship Bulletins has bulletins from the three major lectionaries, for hundreds of topics and with Scripture references representing nearly all of the Old Testament, the Gospels and the Epistles. 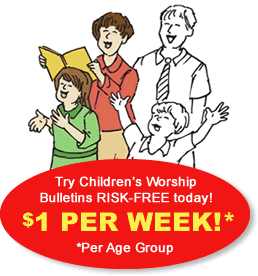 It's easy to plan Sunday school activities about endurance with Children's Worship Bulletins. Included in this short article are two examples that you can use in your class. Print the "We also should ..." activity page from the Children's Worship Bulletins website. Distribute a pencil, scissors and the "We also should ..." activity page to each child. Have the children carefully cut out each of the six shapes (not the children pictured holding the shapes) from their activity page. Explain the object of the game, "The goal is to be the first team to match all of the shapes and write the correct missing words on them." Have the children turn all the shapes face down on the table and mix them up. Yell, "GO!" and wait for the first team to finish. Give each winning team member a small prize. Read aloud Colossians 1:1-14 to reinforce the lesson. Print the "Paul prayed that the Colossians ..." activity page from the Children's Worship Bulletins website. Direct the children to complete the "Paul prayed that the Colossians ..." activity page. Explain, "We're going to brainstorm about the spiritual qualities that would be good examples of Paul's suggestions." Ask the children to discuss what "knowledge of God's will" might be and how to learn what it is. Record their answers on the board (accept any reasonable answer. Prompt them to include the Bible or reading God's Word as one of their answers). Ask the children to discuss what "bear fruit in every good work" might be. Record their answers on the board (accept any reasonable answer). Ask the children to discuss what "endurance" might be in the context of a spiritual quality. Record their answers on the board (accept any reasonable answer). Conclude by asking the children how knowledge of God's will and bearing fruit in every good work exemplify spiritual endurance. Recite together Colossians 1:1-14 to reinforce the lesson. What's better than getting professionally designed and theologically sound materials you can trust for your Sunday school class? Sign up today for a 30-day Risk-Free trial. You'll have access to hundreds of Children's Worship Bulletins. Find exactly what you need to plan Sunday school activities about endurance for your class. You can cancel and owe nothing if you don't find what you need or subscribe for $4.99 per month per age group when you realize how easy Children's Worship Bulletins makes Sunday school planning for your church. Take advantage of our new member offer and receive 50% off on the second age group. Sign up today!